The Autoprom was the first Moates device. It is a combination Emulator, Chip Burner and Datalogger. Today you can buy these devices separately, however this package eliminates the need for 3 separate units. As of writing this article, the only software known to be fully compatible with the Autoprom is TunerPro RT. TunerCat OBD1 Tuner and TTS Datamaster support almost all of the AutoProm’s features. If you plan on tuning Honda vehicles, purchase the Ostrich, Burn1, and HuLog separately or a Demon as there is no software for Hondas that supports the Autoprom and all of its features. The Autoprom CANNOT be used to program F3 Ford chips using the FA nor can it be used to read Ford ECMs using the FE. You will need to look at the Jaybird or BURN2/FA/FE combo for Ford vehicles. The Autoprom does not work smoothly with 29F040 chips. If you need to work with these chips, it is recommended that you purchase a BURN2. The Autoprom should be compatible with almost all USB ports. Its power consumption should be in the 100-150mA range. The APU1 is NOT designed to be left in an engine bay!!! It will fail prematurely if exposed to the heat of a bay. It is designed for a maximum operating temperature of about 80C (175F). The APU1 is NOT designed to be exposed to moisture!!! It will fail prematurely if exposed to liquids. It will fail prematurely from condensation inside its case. If you are going to use the device in harsh environments, try to do so for short periods of time and then program a chip for long term use. We recommend this in general but it is especially important in harsh environments. Due to its internal battery constantly powering portions of the device, the APU1 can easily be ruined by condensation caused by sudden drops of temperature in humid environments. Returning the device to a cool (~50-77F / 10-25C) , dry environment after exposure to high humidity before attempting to use again is a very good idea. Placing it in a sealed bag with dry rice or another desiccant can help if condensation is suspected. Make sure car is in key-off position with no power to the ECM. Remove the ‘stock’ chip and install socket adapter (G1 or G2) if not already present. Remove any chip from the AutoProm ZIF socket! Hook the 28-pin ribbon cable header to the ECM chip adapter socket. Make sure the ‘red’ wire points toward where the notch, or Pin1, would be on a chip normally going in the socket. The AutoProm will auto-select its power source from either the USB port or the ECM header. Get your PC powered on with TunerPro or TunerCat loaded up. Hook USB cable up to the AutoProm and PC. Check the AutoProm switch positions along the backpanel. The innermost horizontal switch can be positioned either inboard (10k – used to select data initiation on older-model vehicles. Try the other ‘open’ setting first!) or outboard (open A-B – almost everything else) depending on ECM requirements. The outer horizontal switch should be in the ‘towards the USB port’ position. (APU1 mode. Other position is passthrough mode, identical to ALDU1). If you haven’t already loaded a file onto the AutoProm, you will get an SES light condition indicating bad PROM content. Now is the time to go ahead and initialize the AutoProm from the PC software (should be under ‘Emulation, Initialize’ option). Once initialized, load the desired binary file into the PC software and upload it to the AutoProm (option should be right next to the ‘Initialize’ button). You may want to select the ‘Verify’ option (in TunerPro) to ensure that the binary upload was successful. If you keyed the vehicle on without a valid binary loaded, you may need to cycle the key off for about 20 seconds to let the ECM reset. At this point, you should have the AutoProm loaded with the desired binary file. The car should now respond as though a chip with the uploaded binary content is installed. If not, then there is an issue. Either the binary is corrupt or some other condition exists. From the PC software, you can make on-the-fly changes in the BIN content and have those changes immediately transferred to the AutoProm and the car should respond accordingly. There are several options within the supporting PC software, such as ‘Checksum Disable’, ‘Upload Entire Tables’, ‘Update Checksum’, and ‘Keep Item Open’, etc., so read through the documentation and practice a little bit so you understand what is going on and what to select. Typically, checksum disable or update checksum should be selected. Use a setting of “AA at 08” for 28 pin applications, and “AA at 04” for 24 pin ECMs. Have fun, and try not to burn anything up other than rubber and fuel! Carry out the same steps described above in the sections on Emulation and Datalogging, except keep the outer horizontal switch in the ‘inboard / toward USB port’ position. Use a simultaneous-supporting program such as TunerPro RT to perform simultaneous datalogging and real-time emulation/tuning. You should see results from changes to the binary on-the-fly right when you make them. 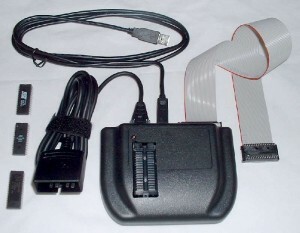 Connect the AutoProm to the USB cable. The USB will supply the power. Place the target or source chip in the ZIF socket. Orientation is critical, and the chip should be placed with its notch or arrow facing toward the ZIF handle and toward the back panel of the AutoProm. The chip should be at the ‘bottom’ of the socket, such that any unused socket pin slots are closest to the handle or backplane. Use a supporting software program, such as TunerPro or FlashBurn to pick read/write operation, file location and name, starting and ending addresses, any hex offsets, bank selection, or other characteristic of the read/write operation. Carry out desired program/read/verify steps as desired, and remove chip from socket. There is a series of videos on our YouTube channel that also explain some of the basics. You can also consult the APU1 Troubleshooting guide if you’re having trouble. On the back of the APU1 you will find a terminal block with 4x screw terminals. The one closest to the USB port is GND/Common, and the other 3 are for channels 1,2,3 respectively. If you have a wideband O2 with 0-5v outputs, it can be wired up to GND/CH1 and TunerPro can then present the ADC data along with the rest of the datastream when operating in AutoProm mode (this feature unavailable in pass-through mode). Configuring this is a little bit complicated and requires comfort with TunerPro RT, basic algebra and some patience. This is a nice article written by Charles Woock on how to configure TunerPro RT to digest 0-5v inputs such as the LM1 and LC1. 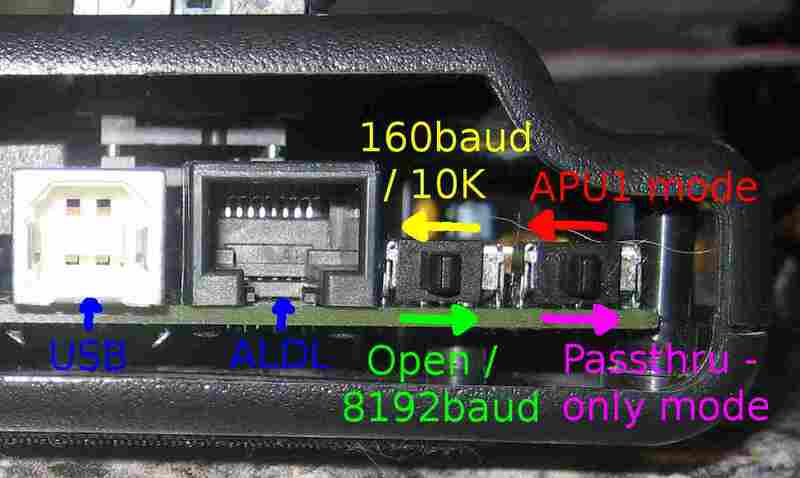 The values can be brought in through the APU1 via the APADC interface. (Note: newer APU1s have the APADC interface built in as standard equipment) The tutorial explains how to set up the ADS file and render values such as AFR Air Fuel Ratio as part of your GM ALDL data stream.